A good hybrid backcountry snowshoe like Tubbs Mountaineer is great until you learn that you have to shell out over 250 bucks. That’s quite some investment for many of those who are just getting into snowshoeing. If you’ve been in similar dilemma, we suggest you take a look at Tubbs Wilderness. Although it’s not purely intended for backcountry exploration, you can still take it to an off-trail drift for more fun challenges. The platform is wide enough to provide adequate flotation on fluffy loose powder and the traction system packs enough grip to cover intermediate terrain. You’re going to love this snowshoe by the time you finish reading this review. Tubbs Wilderness comes with frames similar to those of the Wilderness, only the nose in this model is shorter. The tubular aluminum frames still offer that nice durability while the plastic decks feel nice and solid. The combination of the two doesn’t make the lightest snowshoe but you can have a peace of mind for knowing that they won’t fail after getting a little abuse. 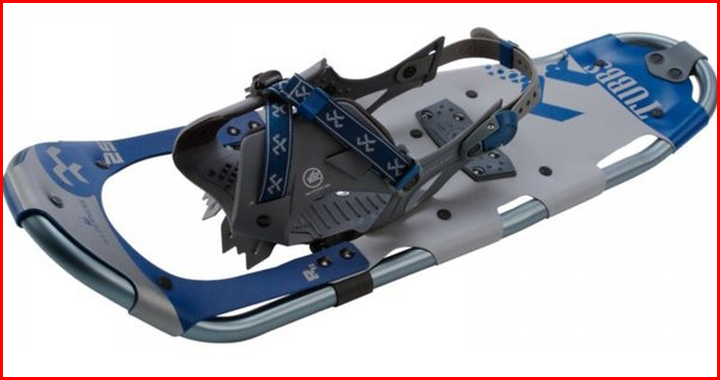 Much like the Mountaineer, this snowshoe is also available in three size options: 25, 30, and 35 inches. The larger footprint leads to better flotation on soft dry powder. We found that Tubbs Wilderness’ performance in deep snow isn’t very fascinating. The snowshoes held up the weight pretty well on loose powder but when there were heaps of fresh snow, it started to sink. Trail performance, on the other hand, is quite satisfactory with the tails rarely skimming on the back. The traction system on Tubbs Wilderness is enough to get you anywhere from flat terrain to rolling hills. Granted, this snowshoe is not made for serious climbs. 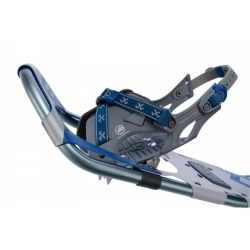 The instep crampons simply lack the aggressiveness you need to tackle steep slopes. Furthermore, the heel crampons don’t come with any perpendicular teeth, making downhill trip a lot trickier. That being said, Tubbs Wilderness is an ideal choice if just want to go for winter backpacking around forest service area or national parks. They are stable under weight and the lateral cleats alongside the frames make side hilling a breeze. The bindings on Tubbs Wilderness look somehow unusual but they’re surprisingly easy to set and once they’re in place, you can forget them. They won’t get loose no matter what you’ve been through in your trekking. Sporting only a single strap, you need to slide in the buckle into the clip first after you position your foot. After that, simply pull the strap until it’s tight enough and secure it. There’s a hook to hold the remaining loose straps. Getting off is also a breeze. All you need is push the locking tab that clips the buckle and that’s it. The straps and the locking tab in Tubbs Wilderness’ bindings are attached to large pads that “hug” both sides of your boots. There isn’t any toe locator or sort of that to keep your toe box from sliding forward, which may make you question its security on foot. Well, I tell you this. As long as you set and adjust the strap to the right tightness, your boots won’t slip forward. The bindings are completely secure and the large pads add a bit of comfort by distributing pressure better. Still not convinced? Find out how Tubbs Wilderness fares compared to other snowshoes in our list Top 10 Best Snowshoes of 2017.